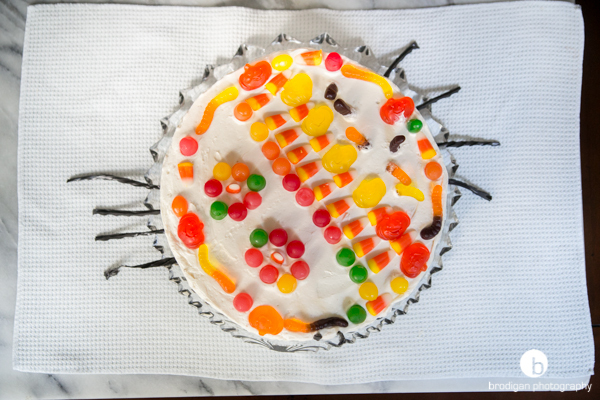 My intention for this final Halloween dessert was to replicate a jack o’lantern cake that I had made several years ago. 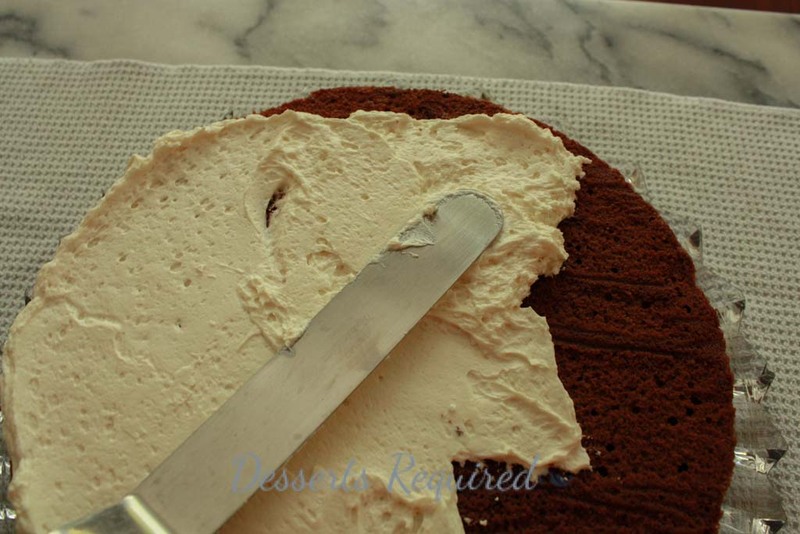 I baked the chocolate cake and finished it with a creamy buttercream. 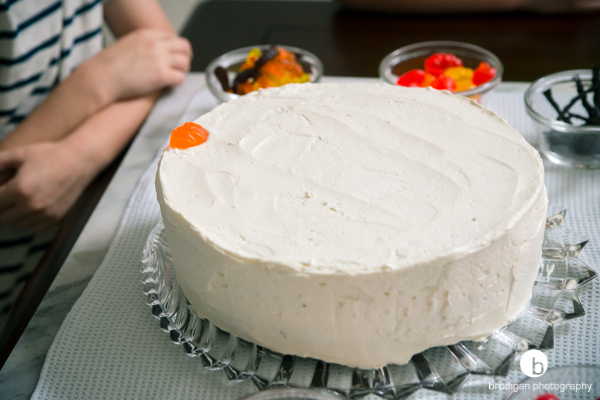 In the past I colored the buttercream with orange food coloring, so it resembled a pumpkin. 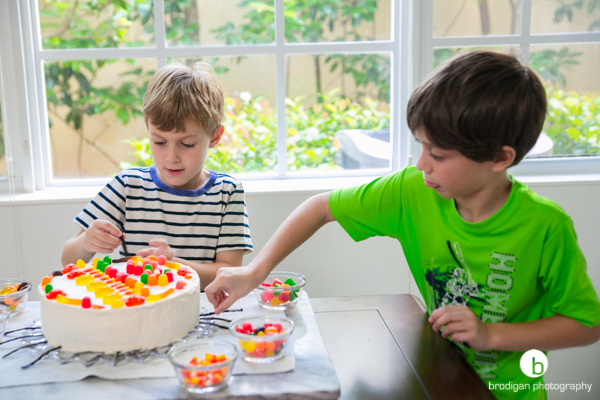 This year Samuel and his friend, Aron, were going to decorate the cake. I decided to give them a completely ‘blank’ slate and leave the buttercream white. I used to have very specific candies for the eyes, nose, mouth and sides of the jack o’lantern. 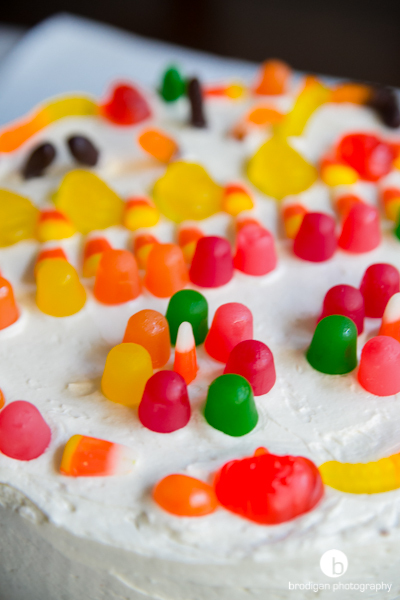 This year, I bought a bunch of different kinds of candies and let the boys decide how they wanted to decorate the cake. Samuel and Aron spent time talking about where they wanted to place each piece of candy and the patterns they wanted to make. It was adorable watching them take the time to do this. How did they do? 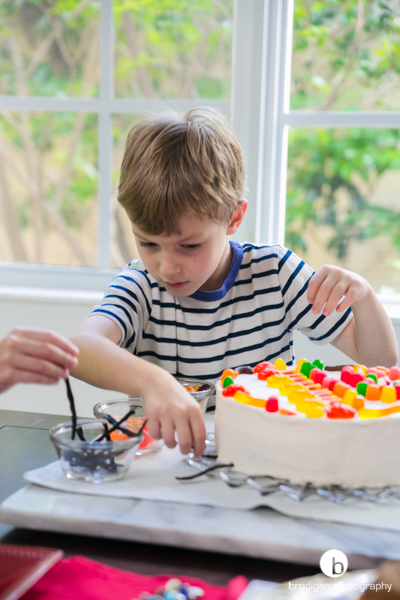 I will let you be the judge, but suffice to say, I will let them decorate my cakes anytime! Today, we all have the added pleasure of having my friend, Tom Brodigan (who happens to be Aron’s father), serve as my photographer for the featured image. 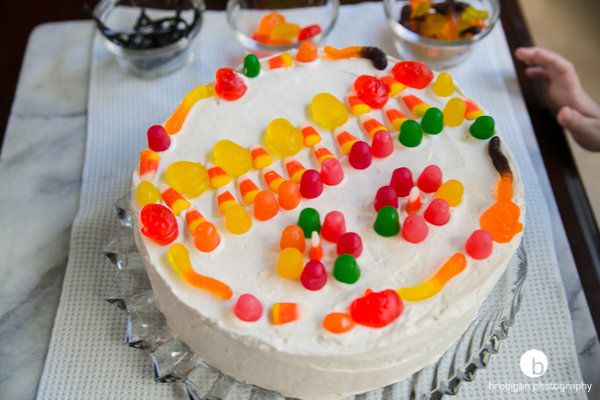 I hope you have enjoyed viewing his beautiful and artistic work over the past five blog posts as much as I. Today´s photos of the Halloween Cake are but a few examples of his creativity. Please click over to Tom’s personal website, brodiganphotography.com, to see more of his wonderful work. Any Halloween candy you want. I used gummy spiders, jelly beans, gum drops, licorice sticks and candy corn. Preheat the oven to 350°. Grease two 10” baking pans. Line with parchment paper and set aside. 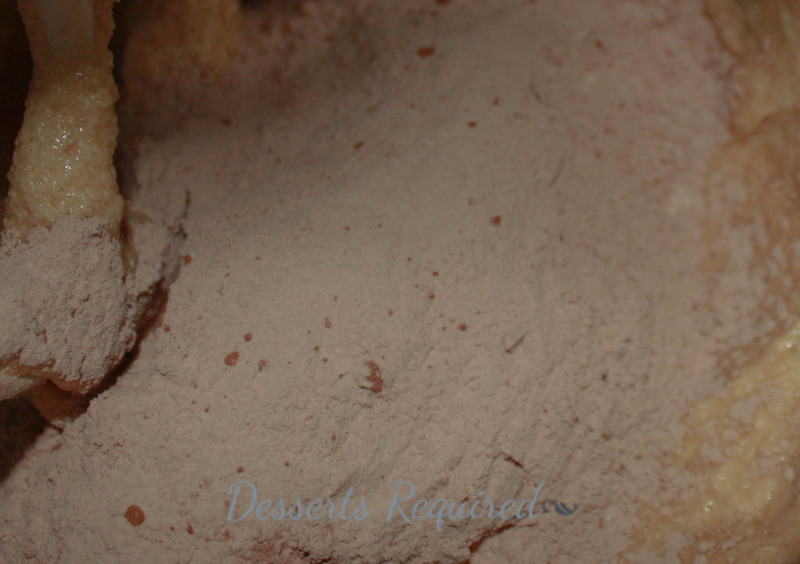 In a small bowl, whisk the flour, cocoa, baking soda and salt together and set aside. 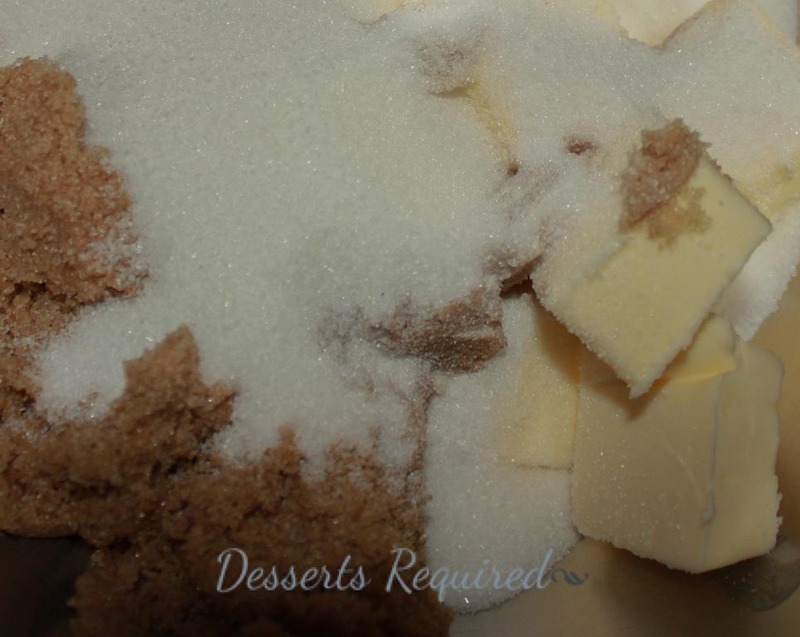 Beat the butter, brown sugar and sugar on medium-high speed in a mixing bowl until light and fluffy, about 3 minutes, scraping the bowl down as needed. Add the eggs, one at a time and scrape the bowl down in between additions. 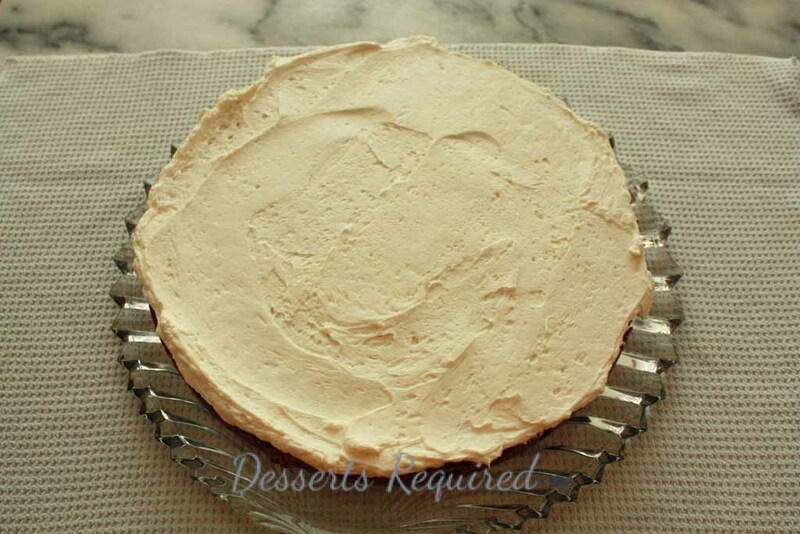 Add ½ of the dry ingredients followed by the sour cream, milk and vanilla. 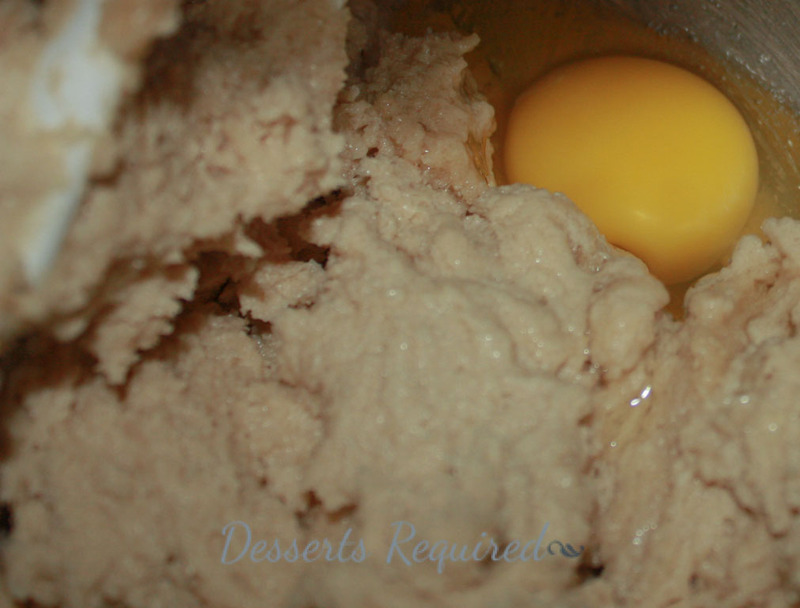 Add the remaining dry ingredients. 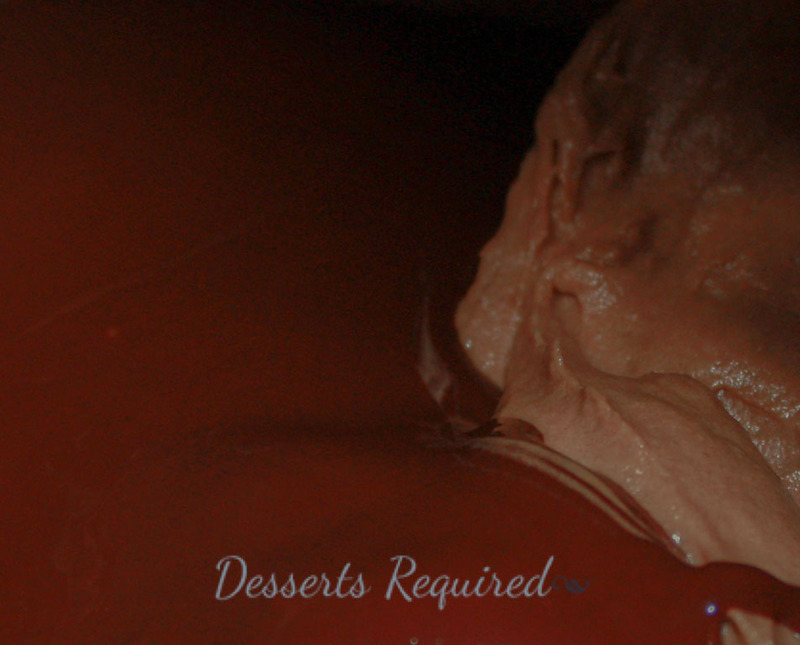 Blend in the melted unsweetened chocolate. Lastly, add the water and mix just until smooth. 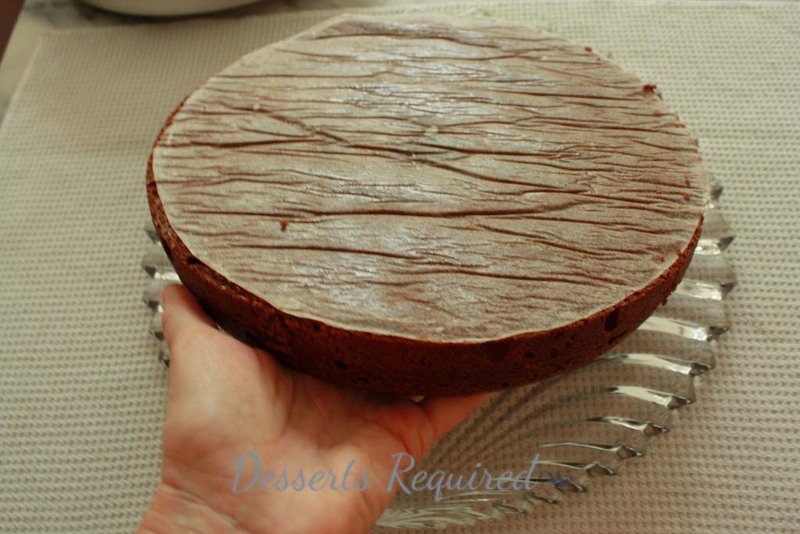 Divide the batter between the two pans and bake in a 350° oven for 30 minutes. Cool for 10 minutes before flipping the cakes onto a cooling rack (and then right them using a second cooling rack). Cool completely before frosting. 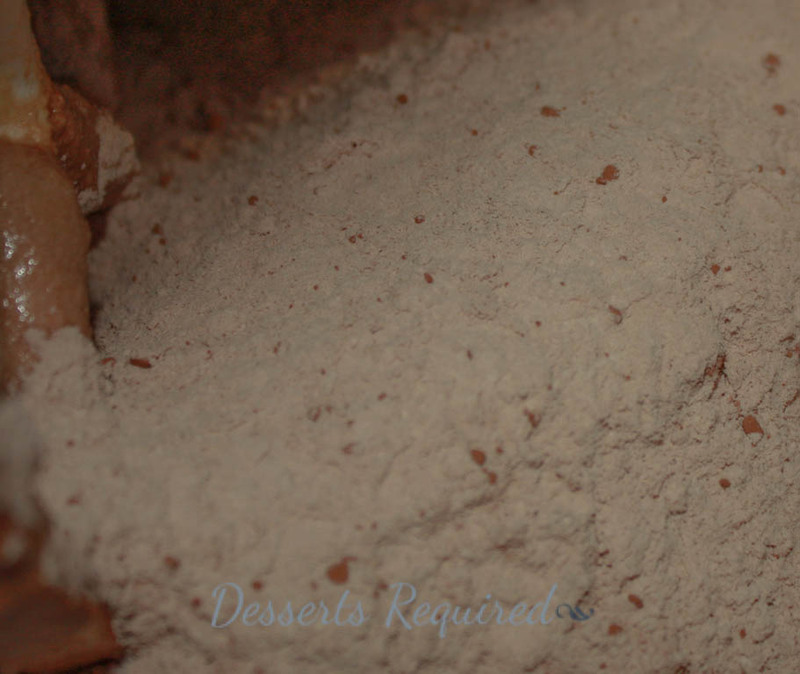 Place the butter, confectioners sugar, vanilla and 4 tablespoons of milk into a large mixing bowl. Mix on low speed initially and then beat on medium high speed for about 2 minutes, scraping the bowl down a couple of times. 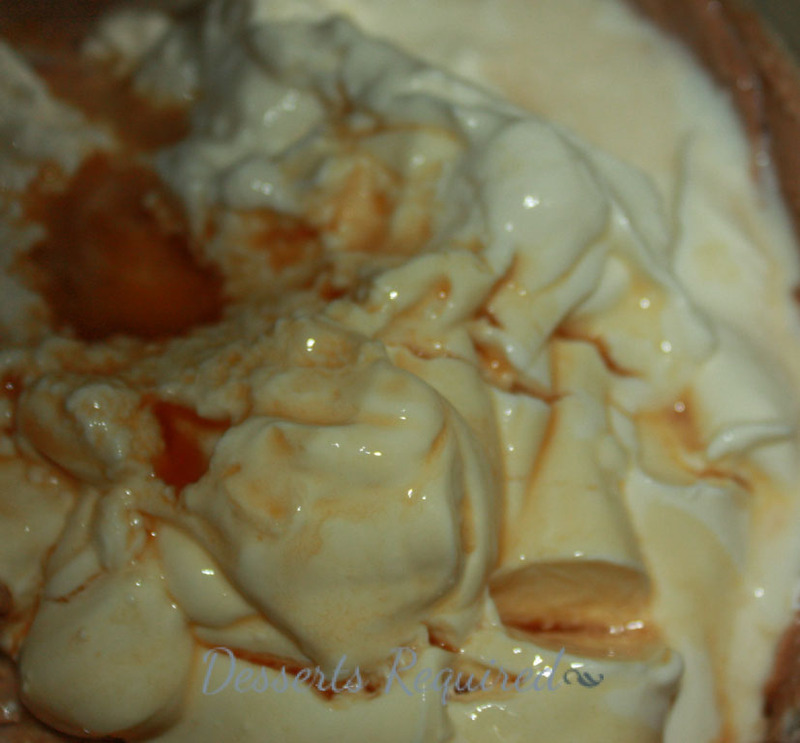 If the mixture is too stiff, add more milk, 1 tablespoon at a time. 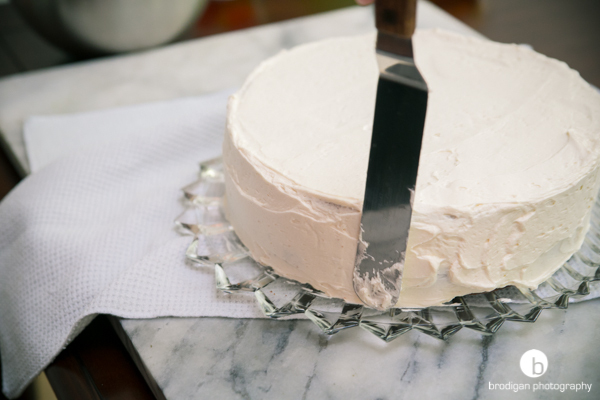 Place one cake layer on a 10” cake board or a serving plate and top with ¾ cup of buttercream. 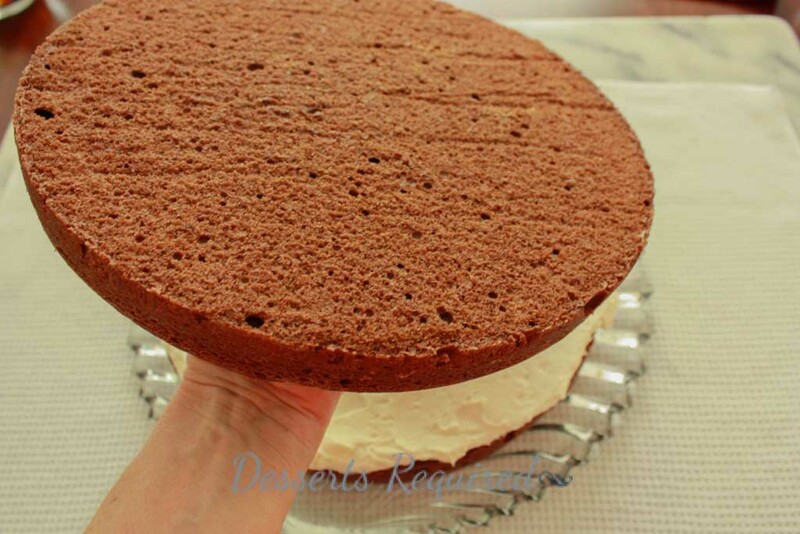 Top with the remaining cake layer. 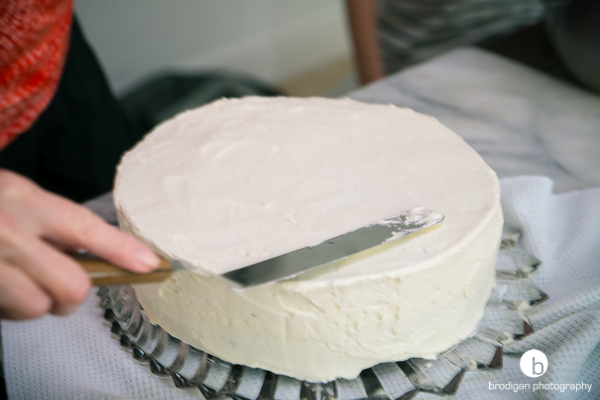 Spread the remaining buttercream over the top and sides of the cake. 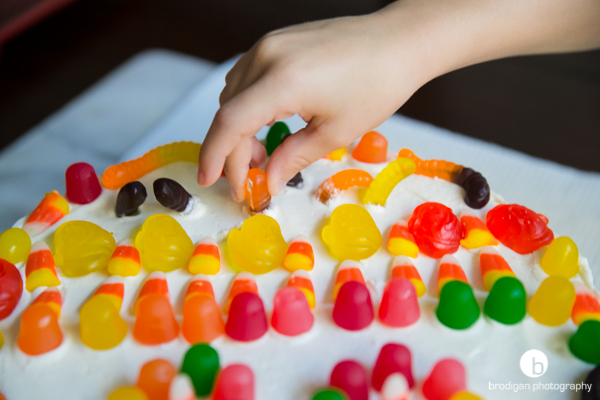 Decorate the cake using the selected candies. 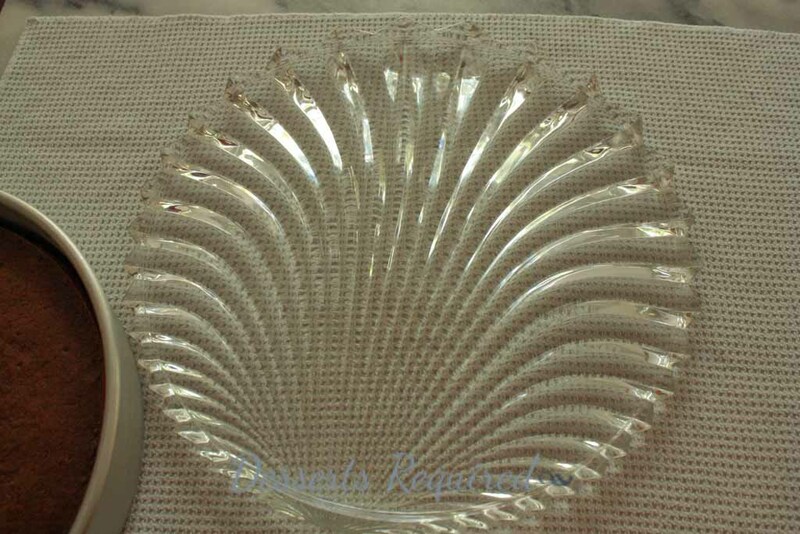 Be as creative as you like….total carte blanche! 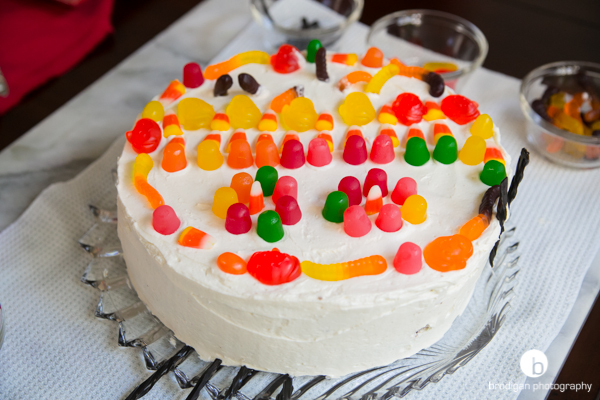 In terms of decorating this cake, the possibilities are endless. 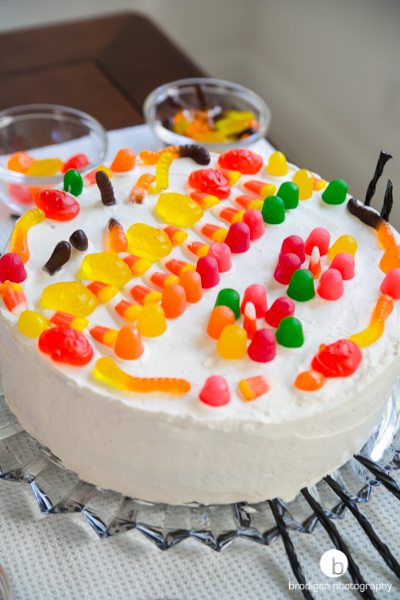 You may use food coloring to tint the buttercream and/or select other non-candy items to decorate the cake. 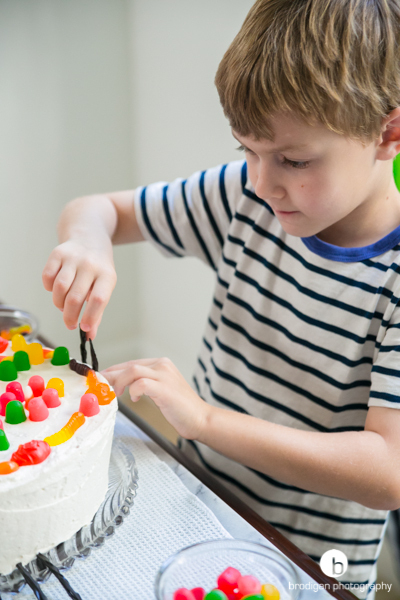 If you do not have time to bake and finish a cake, buy a plain cake and let the kids have a blast decorating it. Win/win situation. Your niece will LOVE you for this…in addition to ALL the other reasons! 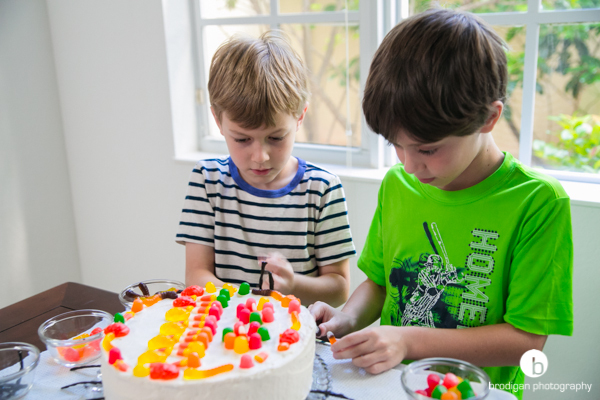 The boys did such a nice job on the cake! Did they eat as much candy as they decorated with? My two wouldn’t have been able to resist. Beautiful photos! 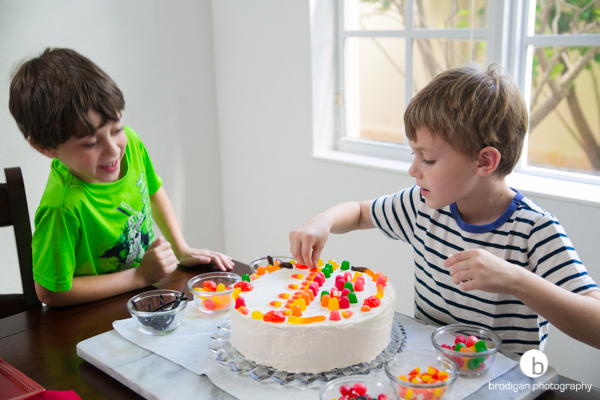 The funniest part, at least to me, was the fact that neither boy wanted to eat the cake or candy. They were totally focused on the task at hand and then went off to play. I, on the other hand, could not wait to eat the cake! 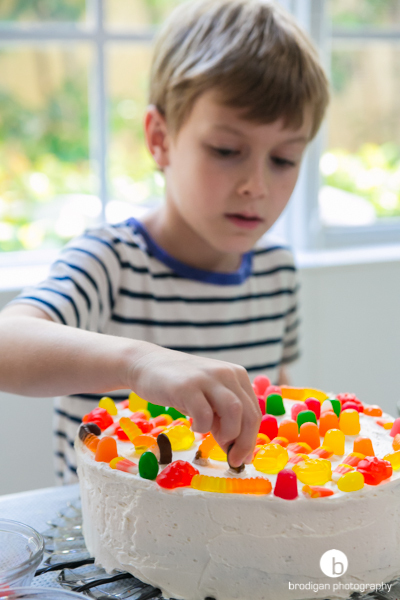 Now that looks like a fun cake! I bet they dug in afterwards! Amazingly, the boys finished their ‘job’ and then went to play, declining the offer to try a piece. Kids today!! I love Tom Brodigan’s pictures, too. He is one very talented photographer!! They did a fantastic job! 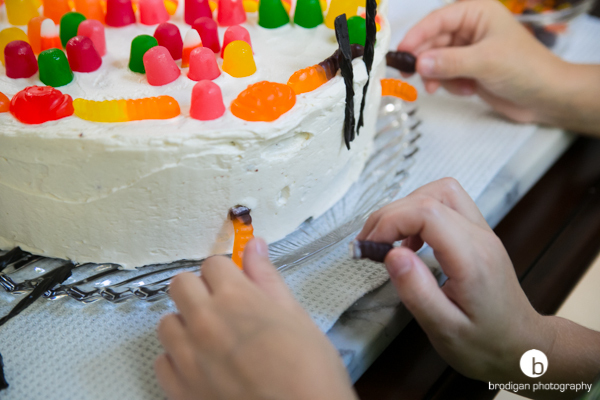 I love how excited kids are when they’re given free reign to decorate a cake. PINNED! You are so sweet. I thought they did an amazing job and I love when kids are given free reign to create and decorate! Looks great! I think it’s always good to get our kids involved in the kitchen adventures. There’s great joy in observing kids engulfed in complete artistic freedom. A super way to switch things up this year, Betsy. May you and yours have a hauntingly good Halloween! Save the Butterfingers for me! !